To purchase tickets, please click on the links on the right side of this page. Presented by HATs Inc, The Clare Valley’s Performing Arts Organisation & Presenters. This year’s Carnival of Music brings excitement to the Clare Valley with a ripping blend of brand new acts from around Australia and SA and the return of several Carnival favourites. 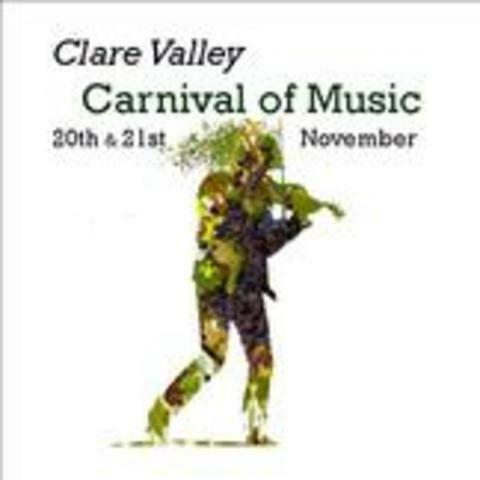 Carnival of Music continues to develop its two ongoing themes: ‘From Clare To Clare’ and ‘Bringing The World to the Clare Valley’. A feature of the Carnival is it’s intimate performance spaces and we invite audiences to get up close to some superb music during the weekend, enjoy some great food, arts and experience good times in the Clare Valley’s most picturesque heritage town. The Friday Night opening celebrates the Clare To Clare connection with a feast of Celtic and Gaelic music featured two sensational acts from Melbourne: TheFiona Ross Band, with Australia’s foremost female Scottish singer together withCo-cheòl, last years Carnival hit act with their superb acapella and musical presentations. Add to this The Liam Og Ceilhi Music Band and we have the ingredients of a huge opening night party of music and Celtic culture that you must simply not miss. To create a concert followed by a giant session of music, singing and partying Irish-Style. The main Carnival of Music day on Saturday features fifteen very diverse acts. Australia’s foremost harmonica player Tony Ayers (Sydney) will astound you with his lightning blues & jazz numbers when he appears with The Fabulous Ayers Brothers. On a Blues theme Carnival welcomes back the Queen of Boogie Woogie; Jan Preston (Sydney) with two different shows celebrating Boogie woogie, blues and honky tonk piano.. Audiences will experience some brilliant world music at the Carnival including a performance by acclaimed instrumentalistZhao Liang on Chinese zither and Afrobeat band AfroOz Musica playing sensational high energy East & Central African urban dance music. Six piece band Yellow Blue Bus brings their astounding Eastern European world music featuring the Ukranian Bandura. Carnival will feature a performance of HAT’sSongs Of Adelaide, our special original music project. Other acts include, TheCourthouse Ladies Choir, The Reverend & Mrs Rowdy playing Americana songs, Me & Me Mates with a show about Australian bush songs from the era of Henry Lawson & Banjo Patterson, Careless River playing country jazz, Duo Montagne presenting European jazz ballad classics and Brillig with a concert of storytelling songs. Auburn township comes alive during the Carnival weekend with the spectacular Arts Market getting bigger and being joined by a Regional Produce Market. (Mid North & Flinders Ranges) These are totally free events that greatly add to the Carnival of Music and will be located in the main-street & Institute Hall..